What is a Sleep Apnea Mask? Part of a CPAP machine, the mask is used to release pressurized air. A sleep apnea mask is a plastic face mask that covers the nose and sometimes the mouth. The mask is connected to tubing which is inserted into a continuous positive airway pressure (CPAP) machine. The CPAP machine releases pressurized air, which will travel through the tubing and out of the sleep apnea mask. 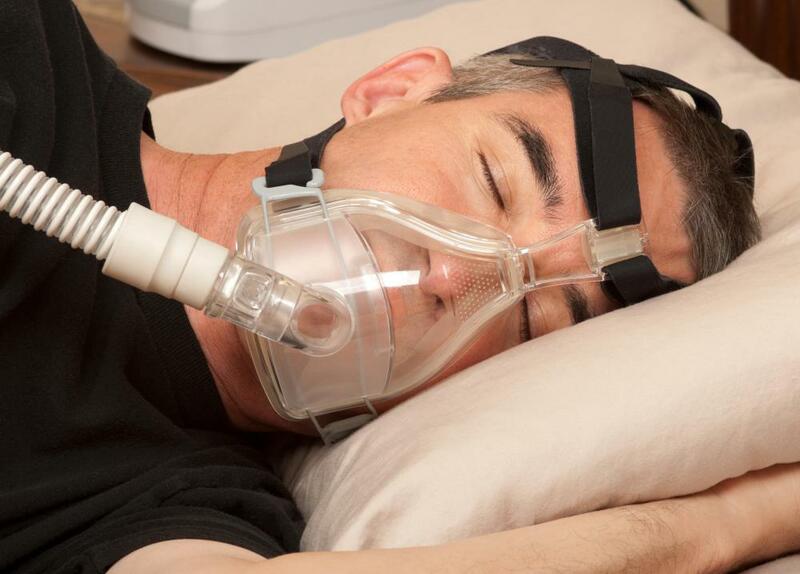 The mask and CPAP machine help to control sleep apnea, a disorder diagnosed by a physician. Sleep apnea is a disorder where the person will breathe slowly or stop breathing for short periods of time during the night. It is diagnosed after an overnight sleep study is done by a doctor. There are many causes of sleep apnea, including obesity, diabetes, or heart conditions. One medical option to help with sleep apnea is CPAP therapy. CPAP therapy requires quite a bit of sleep apnea equipment. The necessary equipment includes a sleep apnea mask, headgear, tubing, and the CPAP machine. The sleep apnea mask needs to be fitted for comfort for each individual. The mask is usually worn the entire night while the person is sleeping. For this reason, it needs to be easy to put on and wear for long periods of time. There are several styles to choose from when finding the right sleep apnea mask. Many of the masks go over the nose, but some cover the mouth and can be a good choice for those who breathe mostly out of their mouths. Most masks are a triangle shape for the face and come with straps called headgear. The headgear is adjustable and keeps the mask tightly on the face. The material that is used to make a sleep apnea mask needs to be flexible and soft. Many masks are made from silicone, but some are made from rubber or a gel-like material. A sleep apnea mask that is called a gel mask is often very comfortable and can provide a tight seal to the face. It is important to purchase a mask that is comfortable and durable, as it will most likely be used every night. Many health insurance companies will pay for one sleep apnea mask and the other equipment that is needed for sleep apnea therapy. Some people choose to have more than one mask and will have to pay for additional masks themselves. Paying for a mask out of pocket can be expensive. Masks can be easily found, as many medical equipment companies produce and sell multiple models. What Is the Connection between Sleep Apnea and Diabetes? How Do I Choose the Best CPAP for Sleep Apnea? What is the Connection Between Sleep Apnea and Weight Loss? What is the Connection Between Sleep Apnea and Obesity? What is Involved in a Diagnosis of Sleep Apnea?